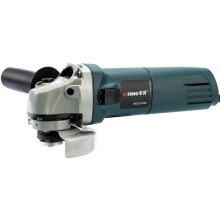 This is an efficient, safe and practical multifunctional angle grinder. It can be used for grinding and cutting metal, stone and wood. It can also be used for polishing. It is a household and industrial electric angle grinder. The motor is resistant to high temperatures, has a long life, is safe and stable, and has stronger power. Main spindle self-locking design makes it easier and faster to remove the grinding disc. User-friendly handle design for better comfort. The side switch design is convenient for one-hand operation, providing safe protection. Independent air duct ensures adequate airflow and prevents overheating of machine. Suitable for polishing, grinding and cutting of metal, stone and wood. 1. Please keep clean of the work area. 2. Do not use the tools in the rain, excessive humidity or where there is flammable liquids and gases. 3. Must wear overalls and protective glasses when working. 4. The wire must be disconnected when not in use.